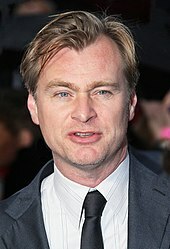 Christopher Edward Nolan, CBE (/ˈnoʊlən/; born 30 July 1970) is an English film director, screenwriter, and producer. His ten films have grossed over US$4.7 billion worldwide and garnered a total of 34 Oscar nominations and ten wins. 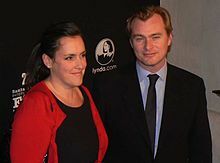 Nolan has co-written several of his films with his brother Jonathan, and runs the production company Syncopy Inc. with his wife Emma Thomas. 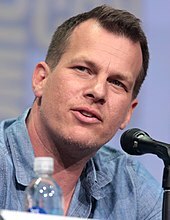 Having made his directorial debut with Following (1998), Nolan gained considerable attention for his second feature Memento (2000). The acclaim garnered by his independent films gave Nolan the opportunity to make the psychological thrillers Insomnia (2002) and The Prestige (2006) for a major Hollywood studio. He found further critical and commercial success with The Dark Knight Trilogy (2005–2012), Inception (2010), Interstellar (2014), and Dunkirk (2017). Nolan's films are typically rooted in epistemological and metaphysical themes, exploring human morality, the construction of time, and the malleable nature of memory and personal identity. His body of work is permeated by materialistic perspectives, nonlinear storytelling, practical special effects, innovative soundscapes, large-format film photography, and analogous relationships between visual language and narrative elements. In addition to his filmmaking, he is an advocate for film preservation and the continued availability of film stock. Throughout his career, Nolan has received many accolades and honours. Time magazine named Nolan one of the 100 most influential people in the world in 2015, and in 2019, he was appointed Commander of the Order of the British Empire for his services to film. When working with actors, Nolan prefers giving them the time to perform as many takes of a given scene as they want. "I've come to realize that the lighting and camera setups, the technical things, take all the time, but running another take generally only adds a couple of minutes ... If an actor tells me they can do something more with a scene, I give them the chance, because it's not going to cost that much time. It can't all be about the technical issues." On set, Nolan avoids video village by using a handheld monitor when filming. Cillian Murphy said, "he creates this environment where it's just you and the actor or actors, there's Wally [Pfister], the camera man, and he stands beside the camera with like his little monitor but he's watching it in real time. And for him the performance is paramount. It's the connection between the actors. He allows room for spontaneity." Gary Oldman praised the director for providing a relaxed atmosphere on set, adding, "I've never seen him raise his voice to anyone." He observed that Nolan would give the actors space to "find things in the scene", and not just give direction for direction's sake. Kenneth Branagh also recognised Nolan's ability to provide a harmonious work environment, comparing him with Danny Boyle and Robert Altman: "These are not people who try to trick or cajole or hector people. They sort of strip away the chaos." Nolan is married to Emma Thomas, whom he met at University College London when he was 19. She has worked as a producer on all of his films, and together they founded the production company Syncopy Inc. The couple have four children and reside in Los Angeles, California. Protective of his privacy, he rarely discusses his personal life in interviews. However, he has publicly shared some of his sociopolitical concerns for the future, such as the current conditions of nuclear weapons and environmental issues that he says need to be addressed. He has also expressed an admiration for scientific objectivity, wishing it were applied "in every aspect of our civilization." Having made some of the most influential and popular films of his time, Nolan's work has been as "intensely embraced, analyzed and debated by ordinary film fans as by critics and film academics". According to The Wall Street Journal, his "ability to combine box-office success with artistic ambition has given him an extraordinary amount of clout in the industry." Geoff Andrew of the British Film Institute (BFI) and regular contributor to the Sight & Sound magazine, called Nolan "a persuasively inventive storyteller", singling him out as one of the few contemporary filmmakers producing highly personal films within the Hollywood mainstream. He also pointed out that Nolan's films are as notable for their "considerable technical virtuosity and visual flair" as for their "brilliant narrative ingenuity and their unusually adult interest in complex philosophical questions". Film scholar David Bordwell compared Nolan to Stanley Kubrick, citing his ability to turn genre movies into both art and event films. Film director and critic Mark Cousins also applauded Nolan for embracing big ideas, "Hollywood filmmakers generally shy away from ideas — but not Christopher Nolan". Scott Foundas of Variety declared Nolan "the premier big-canvas storyteller of his generation", while Justin Chang of the Los Angeles Times called him "the great proceduralist of 21st century blockbuster filmmaking, a lover of nuts-and-bolts minutiae." In 2008, esteemed film critic Philip French called Nolan "The first major talent to emerge this century." The Art Directors Guild (ADG) selected Nolan as the recipient of its Cinematic Imagery Award in 2015, an honour bestowed upon those whose body of work has "richly enhanced the visual aspects of the movie-going experience". He was selected as the 2015 Class Day speaker at Princeton University. "Nolan, more than a film producer, is a thinker and visionary in our age and we are thrilled to have him deliver the keynote address," said Class Day co-chair Hanna Kim. Nolan was awarded the Empire Inspiration Award at the 20th Empire Awards. The director was also honoured with a retrospective at the Walker Art Center in Minneapolis. On 3 May 2017, Nolan received the 2017 FIAF Award before a special 70 mm screening of Interstellar at the Samuel Goldwyn Theater in Beverly Hills. In 2018, Nolan was awarded the inaugural Vanguard Award from The Digital Entertainment Group, in recognition of his use of technology "to deliver increased scale and resolution, enhanced color and immersive audio to film audiences both in cinemas and in the home theater environment." Institut Lumière described Nolan as "one of the greatest Hollywood auteurs" and presented a retrospective of his work in 2019. Critical, public and commercial reception to Nolan's directorial features as of 17 April 2019[update]. ^ James, Oliver; von Tunzelmann, Eugénie; Franklin, Paul; Thorne, Kip S. "Visualizing Interstellar's Wormhole". aapt.scitation.org. doi:10.1119/1.4916949. Retrieved 2019-01-29. ^ "DGA Announces Nominees for Outstanding Directorial Achievement in Feature Film for 2017". Directors Guild of America. 2018-01-11. Retrieved 2018-01-11. ^ Giardina, Carolyn (June 24, 2012). 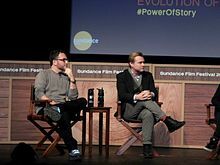 "ILAFF 2012: 'Dark Knight Rises' Cinematographer Wally Pfister Discusses His Directorial Debut". The Hollywood Reporter. Retrieved March 23, 2019. ^ Weintraub, Steve (December 22, 2010). "Exclusive: Exclusive: David Keighley (Head of Re-Mastering IMAX) Talks 'The Dark Knight', 'The Dark Knight Rises', 'Tron: Legacy', New Cameras, More". Collider.com. Archived from the original on March 21, 2011. Retrieved March 23, 2019. CS1 maint: BOT: original-url status unknown (link). ^ "The top 50". The Guardian. Retrieved 17 March 2019.